We’re all trying to move towards greener technology, and a huge part of that involves our daily commute. Bicycles are a great option, but they’re either heavy or expensive, and in big cities you have to go out of your way to prevent someone from stealing them. Izahr Gafni, an Israeli entrepreneur, wants to change that, and he’s thinking cardboard. Yes, you heard right. While it might sound crazy at first, cardboard bicycles can have some huge advantages over regular ones. To start with, cardboard is very light; imagine a bicycle you can easily carry up and down the stairs to your apartment. Cardboard bicycles are also very cheap to produce, which means they’re also very affordable to buy, and not very worthy of stealing. So is the cardboard bike a dream or reality? Surprisingly, after several iterations, Gafni has managed to create a prototype that’s a joy to look at, and apparently is also sturdy, waterproof, and capable of carrying up to 300 pounds. According to Gafni, the bike costs between $9 and $12 to make, which means it can be sold for much lower prices than any bike on the market. If the concept will work, the options are endless: These bikes can be used anywhere in the world, you can add electrical engines and remove them at will, and I can only imagine the cool tricks such lightweight bikes will be able to perform. So far, this magical bike is only a prototype, and only time will tell how durable it is in the long run, but when you see it in action, you can’t help but be impressed. After all, Gafni’s first inspiration was a cardboard canoe, and if that can work, why not a bicycle? 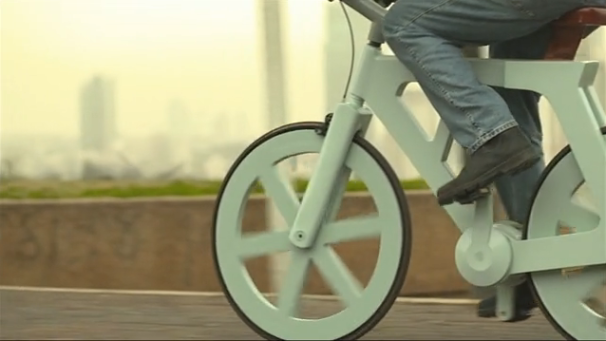 Would you buy a bike made out of cardboard?